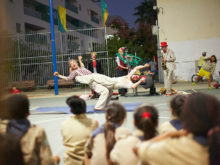 In 2012, Clowns Without Borders Sweden went to Israel and Palestine to perform 12 shows and workshops for 2250 children living in hospitals and centers for children with disabilities. In 2012, Clowns Without Borders Sweden went to Israel and Palestine to help girls from the university to become circus trainers. 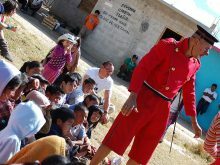 They also performed 10 shows for thousands of children in the refugee camps. In 2012, Clowns Without Borders Spain went to Israel and Palestine to help out Palestinan kids in the West Bank and Bedouins in Israel and the West Bank. They performed 28 shows for 2894 people. In 2011, Clowns Without Borders Sweden did a project in Israel and Palestine. In 2011, Clowns Without Borders Belgium went to Israel and Palestine with the collective Assirk Assaghir and performed 28 shows in hospitals and refugee camps, for 2800 people. In 2010, Clowns Without Borders Ireland returned to Israel and Palestine and partnered with the Palestinian company Assirk Assigar and the Palestinian Circus. They altogether performed 17 shows for 2830 people.